Last year the Carolina Poison Center reported a total of 81 snake bite calls coming from Mecklenburg County – almost twice as many as they received in 2017. The majority of the calls were for copperhead bites, made by medical professionals seeking specific anti-venom dosing and treatment advice. 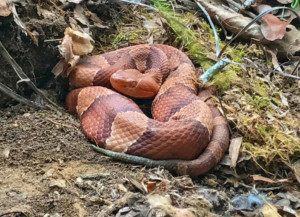 The Charlotte region’s most prevalent venomous snake is the copperhead, but North Carolina is also home to cottonmouths, rattlesnakes (eastern diamondback, pygmy and timber) and coral snakes. The Charlotte region has a total of 37 snake species, most of which are harmless, but due to our overly warm winter, snakes of all kinds are now more active than ever. If you do a lot of walking or hiking around the Charlotte region, you should carry a snake bite kit and/or venom extractor in your backpack or car. Gently wash the area with warm, soapy water. Remove any jewelry or tight clothing near the bite site. Keep the bitten area still, if possible, and raise it to heart level. Call the Carolinas Poison Center: 1-800-222-1222. Ice the area. Icing causes additional tissue damage. Call Carolinas Poison Center at 1-800-222-1222 for questions about a snake bite or for more information.